Ah, springtime... that season of rebirth, when trees and flowers and nature comes back to life, and there's a renewed vigor in the air. 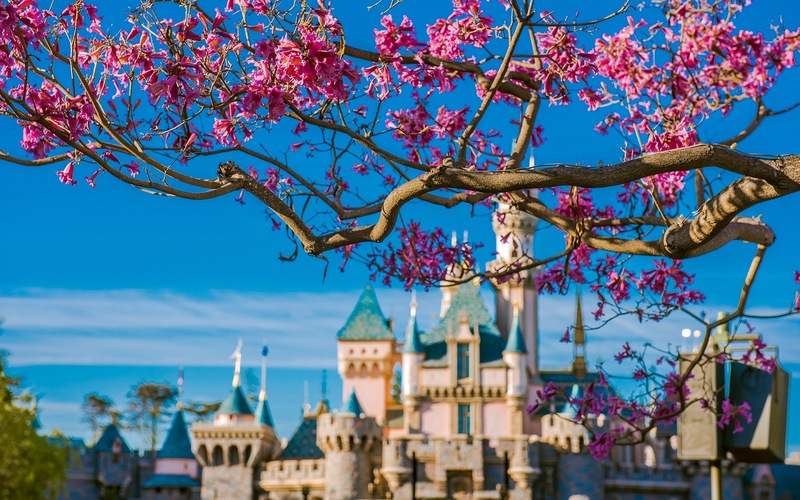 At Disneyland, this time is (and stop me if you've heard this before) most iconically linked to the tabebuia blooms that seem to occur throughout the park. But nowhere are they more scenic than at The Hub, where the Partners Statue stands guard, and Sleeping Beauty Castle sits elegantly just beyond. The pop of pink just makes everything look so much prettier, so I never grow tired of trying to frame different views with a bouquet of blooms. Tabebuia blossoms frame a view of Sleeping Beauty Castle.